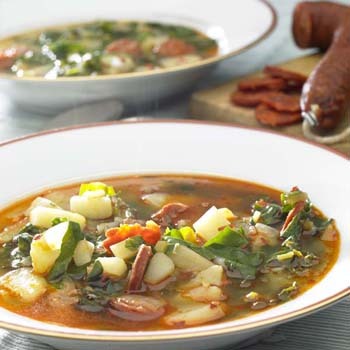 This chunky Portuguese inspired soup has a touch of spice from the hot pepper flakes. With the light broth, the chunks of potato and sausage are hearty enough for a fall evening meal. In soup pot, heat oil over medium heat and add onion, garlic and hot pepper flakes. Cook, stirring for 5 minutes or until softened. Add chorizo, potatoes and chard and stir to coat. Cook, stirring for 5 minutes or until chard has wilted. Add water and salt and bring to boil. Partially cover and simmer for about 20 minutes or until potatoes are tender. Traditional potato leek soup is pureed to be a smooth velvety soup. In this soup, rustic chopped potatoes take centre stage in a chunky rendition of a classic. With a hint of smoky bacon in the soup, it is a surefire winner for soup and sandwich combinations for lunches at home and at the office. In saucepan or small soup pot, cook bacon over medium high heat for about 8 minutes or until crispy. Drain on paper towel lined plate and set aside. Remove from heat. Remove all but 1 tbsp (15 mL) of the bacon fat and return to medium heat. Cook leeks, shallot and garlic for 5 minutes or until softened. Add stock, potatoes and parsley and bring to boil. Reduce heat and simmer for 20 minutes or until potatoes are tender. Add ground pepper. 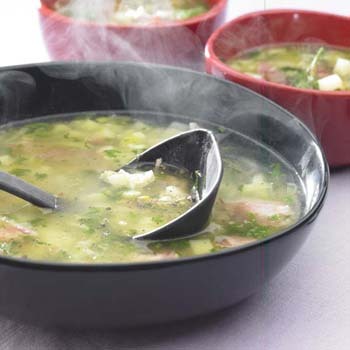 Chop bacon and stir into soup or sprinkle over each bowl before serving. Fresh zippy lemon sparks up the flavour in this salad. A perfect brunch or lunch dish served up during summer. Alongside grilled salmon fillets for perfect summer’s eve. Slice potatoes into 1/2 inch (1.25 cm) thick slices and place in large bowl. Add asparagus and drizzle with 2 tbsp (25mL) of the oil. Add half of the garlic and half each of the salt and pepper. Toss well to coat potatoes and asparagus. Place potato slices and asparagus onto greased grill over medium high heat, close lid and grill turning once for about 10 minutes for the asparagus and 15 minutes for the potatoes or until golden and crisp. Arrange decoratively onto platter. In small bowl, whisk together remaining oil and garlic, lemon rind and juice and mustard. 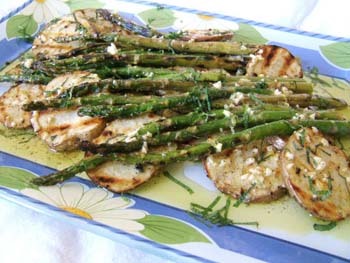 Drizzle over grilled vegetables and sprinkle with mint, if using. Here is a different way to serve up a classic party favourite-smoked salmon. Using thinly- sliced potato rounds as the base gives these canapé’s a delicious twist without compromising the taste of the topping. Slice potatoes into 1/4-inch (7-mm) thick slices and place in large bowl. Add oil, dill, salt and pepper and toss to coat evenly. Place potato slices on greased grill over medium high heat and grill for about 12 minutes, turning once or until golden brown and crisp on the outside and tender on the inside. Remove to large platter. Meanwhile, in bowl beat together cream cheese, milk, onions, capers and parsley. Dollop cream cheese mixture evenly over potato slices. Cut smoked salmon into thin strips and place on top of cream cheese. Garnish with small fresh dill sprigs. 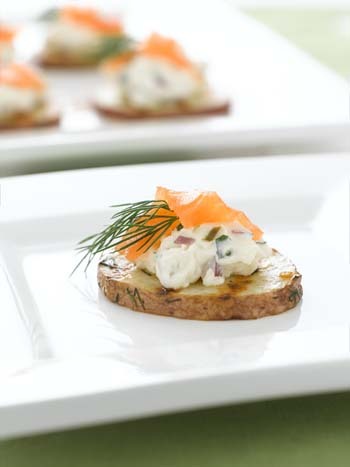 Tip: Chop smoked salmon and stir into the cream cheese mixture and spread over potatoes. Tip: Try other smoked fish like trout and mackerel to replace the salmon. This spicy spread can be enjoyed on its own or dive into it with crusty bread or crunchy vegetables. 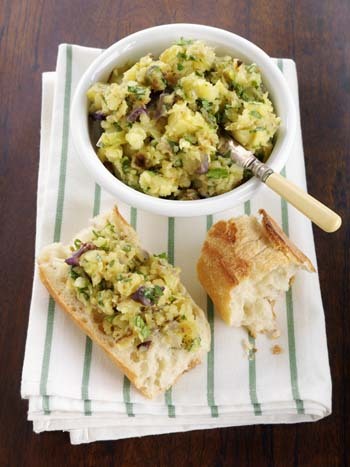 A great side dish option as well for a new take on a classic dish, Skordalia Potatoes. In large bowl, combine potatoes, garlic, peppers and onion. Drizzle with half of the oil. Add fennel and salt and toss to combine. On large parchment paper-lined baking sheet, spread in single layer and roast in 425 F (220 C) oven 45 minutes or until tender and golden brown. Let cool slightly. Remove seeds from jalapeno pepper. Scrape vegetables into food processor and add vinegar and remaining oil. Pulse until slightly smooth but still chunky. Stir in coriander. Tip: Substitute 2 small poblano peppers for the cubanelle and jalapeno peppers. Crunchy on the outside, tender inside, this snack has just a hint of the Tex-Mex spice that kids love. For added pizzazz, serve with tomato salsa, green onions, sour cream, even chili! A fun way to eat red or white potatoes. * Available in supermarket spices section. Preheat oven to 450 F (230 C). Line two baking sheets with parchment paper. Cut potatoes into 1/4-inch (0.5 cm) thick rounds. For young kids, a parent should slice the potatoes. 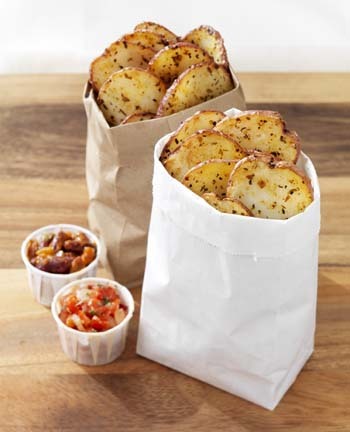 Either place slices in heavy plastic bag with oil and Tex-Mex spice, close bag and shake well to coat potato slices with spices, or mix potato slices in large bowl with oil and spice. Spread potato slices on lined baking sheet. Bake in oven about 35 to 40 minutes or until slices are crisp-edged and browned. Turn baking sheet around if some coins begin to burn before others have browned. Transfer to serving platter. Serve immediately with sour cream, salsa, green onion and chili, if using. Makes one Tex-Mex Potato Coins snack platter (4 to 6 servings).